In looking for a picture of a shell for an earlier post, I happened to unearth our fishing gear, such as it is. When the kids were young, we would often go to the beaches in SC. When it rained, we went fishing. 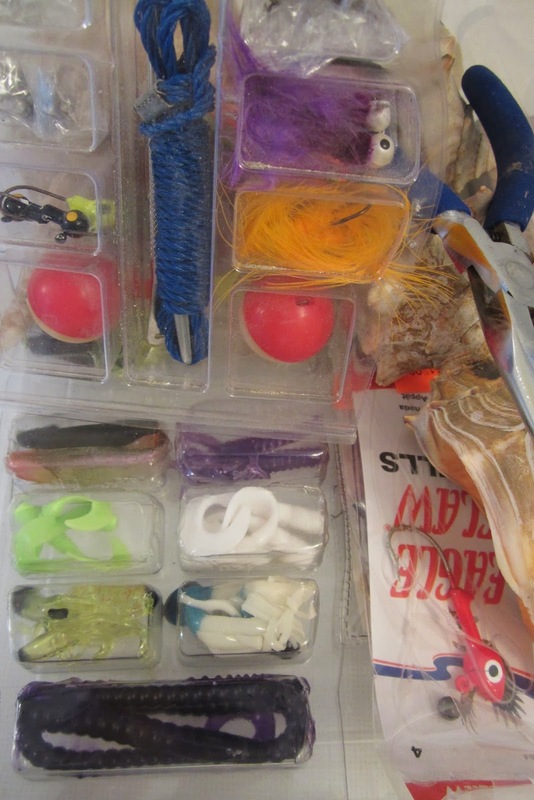 Over the years, we have amassed a sizeable collection of lures and other bits and bobs, which I am loathed to throw out, even though the rods and reels have gone long ago. Although, I enjoyed The Sun Also Rises for its slice 1920s life in Paris, My favourite book by Hemingway is The Old Man and The Sea - a fishing story of the highest order and it did win the Noble prize for literature in 1954. I taught it to every grade 11 class I ever had. Briefly the story is about an old man who snags a huge Marlin, while fishing in his little skiff. The fish tows him far out to sea, before the old man is able to subdue it. He ties it to his boat and slowly makes his way home. It takes days and his beautiful fish is attacked by sharks and gradually eaten away, until there is nothing left but the spine and tail. The old man goes home and the skeleton of the Marlin is left floating in the water. An American tourist sees the bones and asks a waiter about them. He begins to tell the old man's story with the word "Shark." The women doesn't wait to hear the rest. She presumes that the carcase is that of a shark and says, "I didn't realize that sharks had such handsome, beautifully formed tails." I always asked my students not to be tourists of life, but to listen and dig deep to get the whole story.